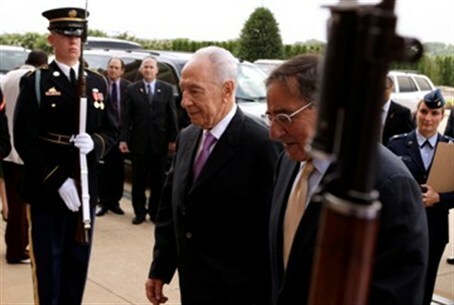 The world must not let Iran take control of the Middle East, President Shimon Peres told U.S. Secretary of Defense Leon Panetta at the Pentagon Monday. “I respect the diplomatic process, but the clock is ticking and Iran continues to race towards manufacturing a nuclear weapon while it also continues to lie and deceive,” the president warned. He was quoted by Israel’s Channel 2 television. PA officials said this week that it is open for “talks” but not for negotiations because Israel must accept its conditions for the creation of the Palestinian Authority as a new Arab country that it wants established within Israel’s borders. He also congratulated Peres on his receiving the Medal of Freedom from President Barack Obama, who is scheduled to present the award on Wednesday.